I really enjoy observing Easter, probably more than Christmas. Of course, there’s really nothing that compares with belting out, “Christ the Lord is Risen Today”! What comes next might surprise you. Around Easter, what I love to listen to every year is U2’s “I Still Haven’t Found What I’m Looking For”. I’ve listened to U2 for a long time, all the way back to my graduate school days in Boulder, CO. Some of the early discussion back then was whether or not U2 was a “Christian band” because didn’t Bono mention the gospel and then conclude that he was looking for something more? Much has been written since to shed light on the lyrics. For those of you that need a bit of a refresher, here’s my take. The song was written by the band after listening to gospel music, bringing to their mind The Staples Singers and The Mighty Clouds of Joy. One of the keys to gospel music is singing about the testimony of the struggle, the valleys, wrestling with a good God in the midst of the incompleteness of life. So if you listen to old or new gospel music, lyrically it speaks of redemption, which has its roots in the experience of American slavery – God will take this horrific situation and one day He’ll make everything right when I “cross the Jordan”. 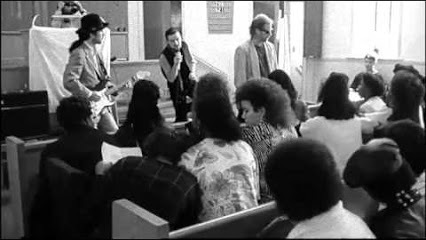 U2’s song was the second track on 1987’s The Joshua Tree but if you want to get the real gospel-influenced flavor of the song listen to the live Rattle and Hum which was a very minimalistic version complete with Harlem’s New Voices of Freedom gospel choir. Biblically speaking, U2’s song is closer to a psalm of lament than it is celebrating, “I Found What I’m Looking For”! Laments fill the book of Psalms. W.H Bellinger estimated about 45% Israel’s worship folder contained portions of lament (Psalm 73) or were completely about lament (Psalm 88). Like good sad songs, some of these Psalms don’t resolve largely because these poetic songs “call” you in to “respond” in worship God even in the midst of darkness or lack of answers. Easter is the day that we joyfully declare Jesus’ resurrection was the great marker in history announcing God’s intent to renew the world. Our lives are just a part of God’s big plan (but thank God they are a part of it). Salvation is not just getting forgiven and then doing what you want or getting real busy. Salvation is entering into God’s grace -filled time and purpose – both chronos and kairos – as He is taking everything broken and making it new. The day then is the declaration and re-declaration every year that God fully intends to mend a broken world filled with broken people and Christ’s resurrection was the inaugural event! So, we joyfully sing at the top of our lungs of Jesus’ work and the death of death itself even though we know that we still haven’t arrived, that our world is sheer madness at times, or that we still haven’t found in fullness what our hearts long for (for more read C.S. Lewis’ Mere Christianity, book 3, chapter 10). It turns out the U2 song is the best way to realistically articulate what’s true of life now (we experience the great joy of life yet still sensing its incompleteness) yet hopefully awaiting the promise of the future! What Kind of Proverbs Person Are You?